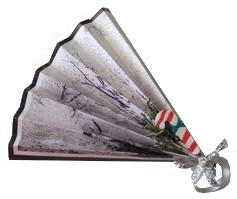 Recycle your old Christmas cards to make pretty paper fans to trim the Christmas tree. You can embellish these little fans with scraps of lace, sequins, glitter or curling ribbon, or just add a hanger and leave them plain. Either way, they look delightful on the tree and also work well as festive decorations when you are wrapping a gift. 1. Cut off the back section of the card. 2. Take the front section and fold it, accordion style, making each fold approximately 1/3 to 1/2 inch deep. Usually, you will fold the card along the longest side, but some cards are almost as wide as they are long; in this case, begin folding on the side that displays the colors and the design of the card in the best way. 3. If necessary, trim the last fold so that it is the same depth as the rest of the folds. 4. Pinch together one end of the folded card and tie securely with thin ribbon or cord. If desired, tie the cord or ribbon into a bow. 5. Add embellishments, using white glue or craft glue to fix in place. 6. If you want to hang the fan on your Christmas tree, pierce a hole along the top fold of the card with a paper punch and and loop a piece of cord through the hole to make a hanger.